HomeGold IRA BlogGoldCan I buy physical precious metals at spot price? When you look up the price of gold on a given day, the figure you are most likely to come across is the spot price. This is the price that is most often quoted on TV and the internet. However, when you go to a coin shop or a precious metals broker to buy physical gold coins or bars, you will quickly realize that they charge more than the spot price. Why is this? What goes into the additional cost? There are several steps that occur between mining raw gold out of the ground and turning it into coins and bars ready to be sold to consumers. Each step involves companies that must account for all necessary operational costs and ultimately make a profit, just like any other for-profit business. Therefore, the prices private companies and government mints charge for bullion have to be higher than the spot price. The gold spot price actually refers to the current price of gold futures contracts on commodities exchanges such as COMEX or NYMEX. If you are trying to buy gold at the spot price, you will be purchasing a futures contract rather than taking immediate physical possession of gold bullion. Tracking the gold spot price day-to-day allows you to see how gold is performing in the markets, but it is not an accurate indicator of how much it will cost you to buy coins and bars from a precious metals broker or dealer. The coins and bars you may buy from a coin shop or precious metals broker such as American Bullion cost more than the spot price, since there are several layers of costs and price markups that go into the production, distribution, and selling of bullion. Companies involved in the process must account for their operational costs and then mark up the prices they charge in order to make a profit. The four main layers are mining, minting, wholesale, and retail. 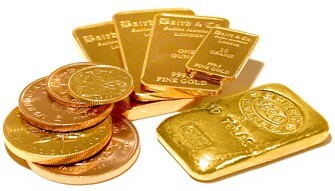 Generally speaking, to turn raw gold from the earth into bullion, the gold is mined out of the ground, made into coins and bars by government mints (such as the United States Mint or the Royal Canadian Mint) or private companies (such as PAMP or Johnson Matthey), purchased in bulk by wholesalers, sold by wholesalers to retail gold dealers or brokers, and then sold to consumers. This series of incremental cost increases and price markups that go into the supply and distribution chain is a market mechanism present in virtually every other industry in existence, from auto parts to zippers. And that, concisely, is why precious metal dealers and brokers do not charge the spot price. American Bullion prides itself on making all of its transactions as transparent, safe, and quick as possible. We specialize in adding physical gold coins and bars to an individual retirement account through a Gold IRA Rollover, in addition to offering a wide range of bullion products available for cash purchase. Call us today at 1-800-326-9598 to speak with an agent, or request a Free Gold Guide. Invest in something real!